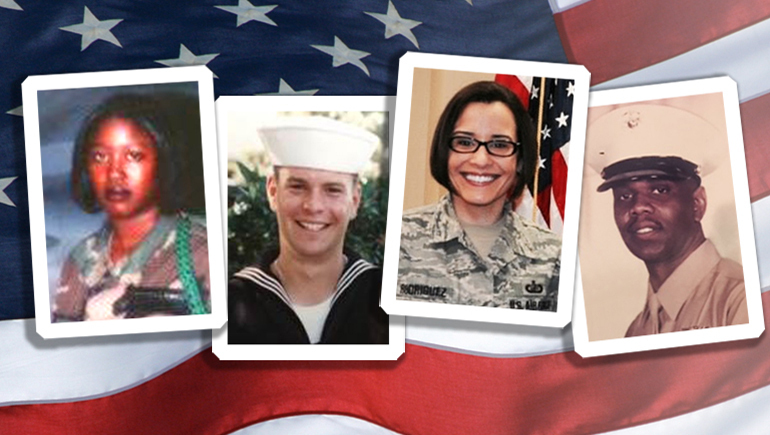 Bristol-Myers Squibb colleagues share how their military experience has helped shape their careers and why hiring veterans makes good business sense. It’s not uncommon to ask your co-workers about their career paths and learn that they may have worked previously in a similar role at another company or perhaps spent time in a different industry. Ask Curtis McDonald, a senior manager of State Government Affairs who spends a lot of his time talking to policy makers, and he will tell you about what it is like to conduct g-force testing for pilots and analyze how much the human body can endure without sustaining injury. This was just one of many job responsibilities and experiences that McDonald had during his time in the U.S. Navy. Despite how vastly different his job duties in the Navy and at Bristol-Myers Squibb may seem, McDonald has found that there are many similar qualities needed for both service in the military and a career in the corporate world. Remembering the discipline he received in military training, McDonald says that the level of responsibility, experience and commitment that veterans bring to the workplace is undeniable. That’s why, McDonald says, it’s crucial that hiring managers seek out veterans when recruiting talent. Understanding that veterans bring exceptional value to the workplace, McDonald wanted to educate the rest of the company and build a support system for fellow employees who have served in the military. In 2012, he co-founded the Veterans Community Network (VCN) People and Business Resource Group at Bristol-Myers Squibb, helping to raise awareness of veterans’ needs and the potential they bring as employees. While veterans bring a multitude of valuable skills to the table, McDonald believes their sense of loyalty is one of the greatest assets they bring to a company. Sharletta Everett, a data quality insurance administrator, comes from a long line of family members who have served in the military, including her dad and cousin who were in the U.S. Army. Growing up, conversations about the military and its different branches were common in her household. Everett joined the U.S. Air Force as an information manager. She provided technical support for the personnel office and was tasked with fixing a great deal of varied computer issues. Strategizing and troubleshooting quickly became her strongest qualities. These skills naturally carried over to her current role at Bristol-Myers Squibb where she supports R&D capabilities within the Business Insights and Analytics department. When it came time to transition out of the military into the workplace, the military had arranged a transition assistance program that provided the tools to write a resume and dress for an interview. The goal was to teach Everett and her comrades how to market themselves for corporate America and show off their transferable skills. Giving back to veterans is a cause near and dear to Everett. She is extremely active in the VCN and is proud of the work that its members do -- not only for employees, but for military members and their families through programs such as Tampa Bay Crossroads. There’s an acronym that Gerald Young, an IT lead in Tampa for the Field & Global Scientific Service Desk, learned in the military and it has stayed with him ever since: JJ-DID-TIE-BUCKLE. It stands for judgement, justice, dependability, integrity, decisiveness, tact, initiative, endurance, bearing, unselfishness, courage, knowledge, loyalty, enthusiasm. Prior to joining Bristol-Myers Squibb, Young served in the U.S. Marine Corps for more than 20 years. By the end of his tour, Young was managing the entire aviation operation for an air station. Young’s time in the military taught him that building a sense of camaraderie within the team is essential to accomplishing a mission or driving business results. But that only happens if you can establish open lines of communication, says Young, who manages a team of more than 20 colleagues. In the military, Young also learned the importance of diversity through working, training and living with people from diverse cultures and backgrounds. Young says this experience was invaluable when it came time for him to lead a team at Bristol-Myers Squibb, allowing him to truly understand and embrace diversity and inclusion as key to driving the success of any mission. When Silka Rodriguez started working at Bristol-Myers Squibb, she had just left the military. Having grown accustomed to standing at attention and other aspects of working in the Air Force, Silka saw an immediate difference in the work culture. In the U.S. Air Force, Rodriguez was a financial management specialist who trained airmen in operations at deployed locations, specifically within financial management. She brought her knowledge from the Air Force to the North America Capability Center (NACC) & Global Capability Strategic Operations. As the lead of Knowledge Management & Onboarding, Rodriguez entered a seemingly new world that required a different level of skill training. “The transition from training airmen who were deployed across the world to training at Bristol-Myers Squibb is of course different, but there are similarities as well,” Rodriguez says. One major difference in her transition out of the military was no longer living under the rule of Don’t Ask, Don’t Tell – a law that, during her time in the Air Force, barred service members from being openly lesbian, gay, bisexual or transgender (LGBT). Leaving the military meant Rodriguez could come out and live proud. “At Bristol-Myers Squibb, being part of the LGBT community was something that was celebrated through our People and Business Resource Groups, and not banned or shunned,” said Rodriguez, who is a tri-chair of Bristol-Myers Squibb’s LGBTA. During her first year of transition to the corporate sector, Bristol-Myers Squibb provided Rodriguez with a mentor. “My mentor was instrumental in guiding me when I didn’t know how to navigate the new environment,” Rodriguez says. Additionally, Rodriguez had a manager who believed in her, Lee Evans, head of the NACC, who encouraged her to start a new chapter of the VCN there. She jumped at the chance.